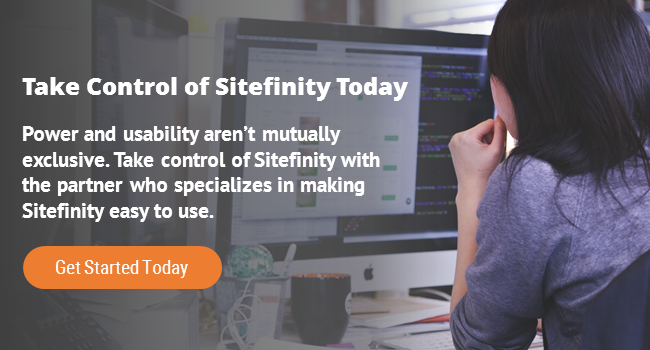 Sitefinity is one of the most powerful CMS’s on the market, but many teams get bogged down by its out-of-the-box limitations. We help you get the most from your website by giving you massive functionality while producing controls so easy to use that you don’t even need to know code. Sitefinity has a lot of power, but oddly enough, we find that many developers just don't know how to configure Sitefinity correctly. We used best-practices to make sure you're using the tool the way it was intended. Which is, giving marketers the ability to make changes without IT support. That should be the goal of any CMS, right? We pride ourselves in our business acumen. As programmers of business-critical applications, we know what it takes to understand a business, its challenges and its requirements. We carry this knowledge into our Sitefinity development. Understanding your business and you team is critical when creating custom functionality and control. Once we understand you and your team, we leverage the powerful platforms that hold up Sitefinity: .NET, Bootstrap, AngularJS and KendoUI. As masters of these tools, we can build a project perfectly aligned to your business. We’re ready to take on your project, no matter what stage it’s in. Whether you’re just getting started with Sitefinity or you’re looking to revamp an existing Sitefinity project, we’ll help you deliver a world-class site with unparalleled control. We can also empower your team to get the most from Sitefinity with personalized training. This training is built around your business needs and your team's existing capabilities, so you're not wasting your budget on unnecessary training.